Can the UltraSling IV be used on left arm? Yes, the Ultrasling IV is universal and can be used on either arm. can i purchase just the shoulder strap?? our model has a terrible and painful single strap. There is a strap kit that can be purchased by calling DJO Global direct at 800-336-6569.
after making all the adjustments my forearm is dropped down past a 90 degree angle. I cant seem to get it to a 90 degree angle. The straps on that sling can be trimmed to make them shorter, which should lit the sling up. Can the Ultrasling IV be worn without the cushion on the hip? Or is it permanently attached to the sling? Yes the Ultrasling can be worn without the pillow. The Pillow is attached to the sling by velcro, just detach and unbuckle the waist strap to remove. When you measure, do you measure arm straight or bent? The Don Joy sling is excellent, much better than Breg. They have put lots of thought into the Ultrasling IV. Now the bad part, due to the price of the sling my shipping was free. However it took 8 days to get my sling. After ordering, two or three days went by without a shipping confirmation. I called and the guy said, "sir your order has not processed because you selected free shipping." The guy had no empathy that I had surgery and needed this higher quality sling. If you select free shipping they will sit on your order and will not immediately process it. HORRIBLE!! Cons: Better braces needs to get their customers orders out the door ASAP regardless of shipping method selected. The Ultrasling IV is very comfortable and well made. Once you get used to putting it on it is very easy and does not put pressure on your neck. The abduction pillow is comfortable and the materials used to hold your arm are breathable and provide support. I've been in it now for three weeks and have no complaints! Highly recommend. Better than the DonJoy UltraSling III. The strap rests on your opposing shoulder and not on your neck. The abducting pillow/bolster has been improved going from the III to the IV. Most comfortable. This is my second rotator cuff surgery in 2 years. The brace provided with the surgery gave me terrible neck pain and accumulated stress in my shoulders. 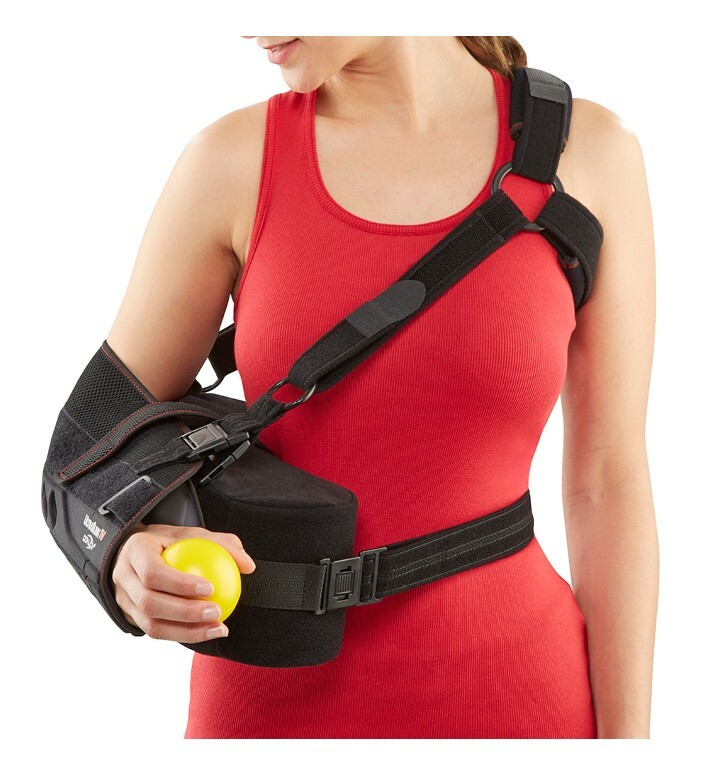 The Donjoy sling design alleviates all this stress and pain. My recovery for my second shoulder is so much much easier and less impactful on my life. I followed fit instructions on website and it fits perfectly. You will not be disappointed. Cons: Less support during sleep. Purchased a week before rotator cuff repair so that I could get a good fit prior to surgery. Followed the sizing directions for purchase exactly and was able to get a great fit on this short, plus sized body. If you have to wear a brace for an extended length of time, this is the one you want! No cutting into the neck and even distribution of weight. Cons: Needed to pay for expedited shipping in order to get the sling prior to surgery. Pros: Sling and abduction pillow fit comfortably. Great purchase! Immediate relief from opposite shoulder, neck & back pain that physician supplied brace caused. Took all the pressure off my neck and my opposite shoulder after having rotator cuff surgery. Only thing I'd change is making velcro tab areas/closures a bit softer. Much better "harness" system unlike the one from the Dr that chokes you on one side of your neck. It runs a little big. I ordered the large and should have ordered a medium, I did just attach the harness to my original Ultrasling III sling. Very comfortable to wear as well. Worth every dime for a shoulder surgery apparatus. The scratches my back up. you have covers for the front but none for the back and none for the back. I get hot and cannot wear a shirt all the time. Since I am stuck at home I should be able to go without a shirt but can't because your sling scratches me:( The sling is otherwise great.